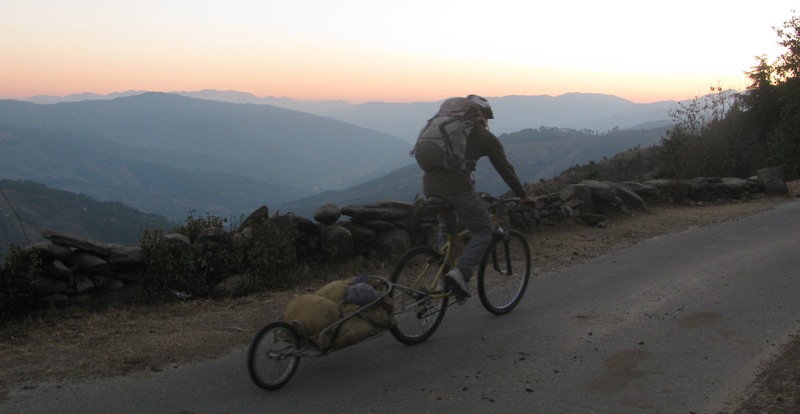 Cycling with trolley attached, is tough in Uttarakhand’s hills. You have long uphill sections. They seem a breeze when tackled in a car, jeep or bus. To know what those roads actually are, you have to either run or cycle. We took turns cycling the Kona, which hauled the trolley. Ahead of Lansdowne we were having a particularly long day. As evening settled in, everything about our condition indicated that we had best halt somewhere. 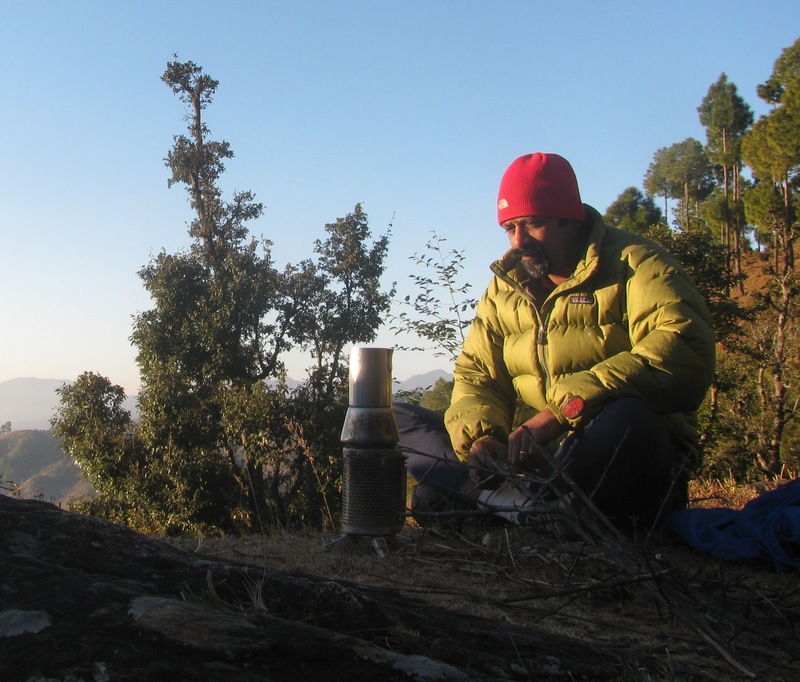 Problem was – there wasn’t any good place to stay or a clearing, quiet and sufficiently out of the way, for us to camp. We felt we might turn lucky if we pushed on. This we did on a very long ascent, half way up which, day transitioned to night and we found ourselves cycling with our headlamps on. Now that – is a very unwise thing to do in the mountains where the road-edge plunges hundreds of feet down. We knew this well. Eventually, at a turning on the road, we found a temple. But we had either run out of food or were exhausted enough to wish that somebody would feed us. We could see lights on a hillside some distance away. Ravi waited at the temple while I went ahead to look for a house and hopefully, a hospitable family who will cook us dinner. Sometimes a trip happens that is so enjoyable that you don’t remember to keep a diary and you can’t subsequently recall where you had been. This cycle trip was in that league. Not more than ten days. Approximately 350-400km covered in the hills; two mountain bikes, one trolley (attached to a cycle) with camping gear, stove, spare clothes, repair kit and food (essentially tea and coffee for the morning), two small backpacks on us. We didn’t have panniers. So this arrangement seemed best. Real cyclists may call us crazy. But we weren’t that real in cycling. We had no goals; we just wished for a nice, winding hill road with camping spot and tea shops en route. Besides, I suspect when one’s grounding is in hiking and mountaineering, some weight to haul, getting roasted by the effort, grinning through it and then laughing at the eccentric fool one is – it all adds to life. When the sun was unbearably hot, we stopped and slept in the shade. When a place seemed particularly beautiful, we stopped to marvel at it. When the road was well-made and there was no traffic, we relaxed into the ride. 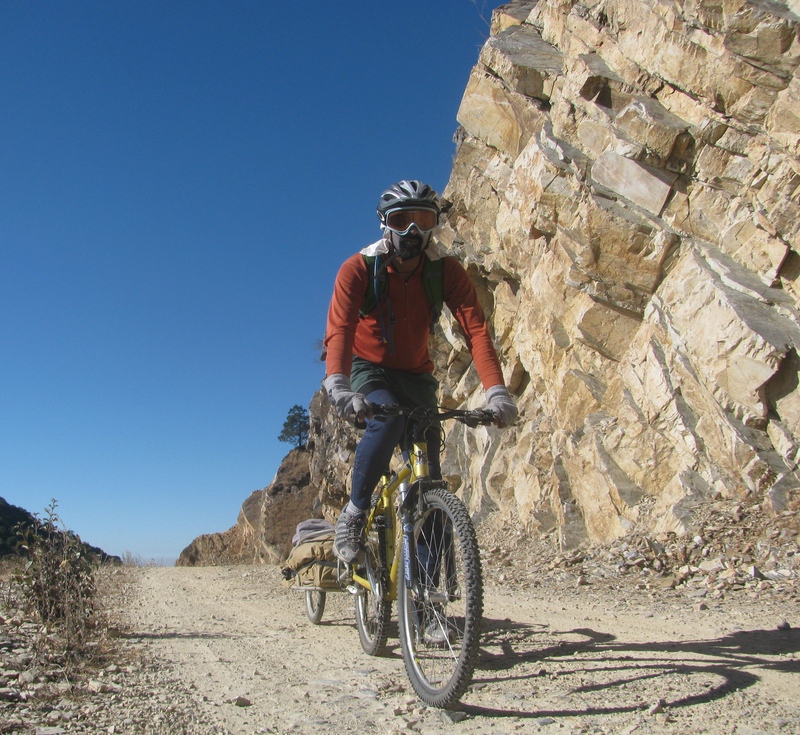 When a terribly rough side road assured to host great Himalayan views beckoned, we ventured forth thankful that our cycles had suspensions. We had destination but none so iron clad that we couldn’t let an instance lead to another – that seemed our trip. 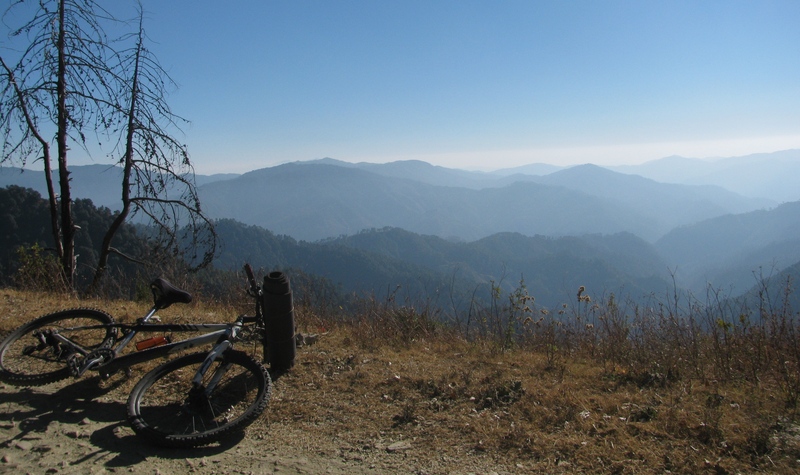 The route was based on recommendations from Punit Mehta, a friend with abundant love for hiking. He had also travelled much on his motorcycle; the roads and side roads on our itinerary were his inputs. I am not a great navigator but I suspect we may have ended up adding a couple of sub-routes of our own. Anyways, the journey was from Ranikhet in Kumaon to Lansdowne in Garhwal and then through a forest road open to traffic, to Maidavan. If I remember correct, we went via Dwarahat, Thalisain and Peersain. The exit wasn’t quite near Ranikhet; it was a day’s drive away. Both cycles – a Kona and a Mongoose – old and well used, performed splendidly. They belonged to Ravi, whose collection in Ranikhet included recumbent bikes and unicycles as well. Self supported travel has two advantages. First it keeps cost low, provided nobody minds you camping around. Second, it lets you know places and people. Independence lets you explore and the moments of dependence – because you know clearly you are dependent and why – makes you grateful for help received. Good behaviour is half the job done on any trip or expedition. We had a couple of wonderful camps and tea shops that served us food. At some places we slept on a veranda or in a shed. In remote areas, the local shop may also be tea shop and traveler’s lodge. We caught up on news chatting with shop owners. In their lodge rooms, we met traveling salesmen and got a sense of rural marketing. We met women out cutting grass; seeing us they halted, struck up a conversation, inquired about our journey and sought a group photograph. We passed a hillside featuring many people trudging up to a local temple; got invited to the festival, got our share of sweets. 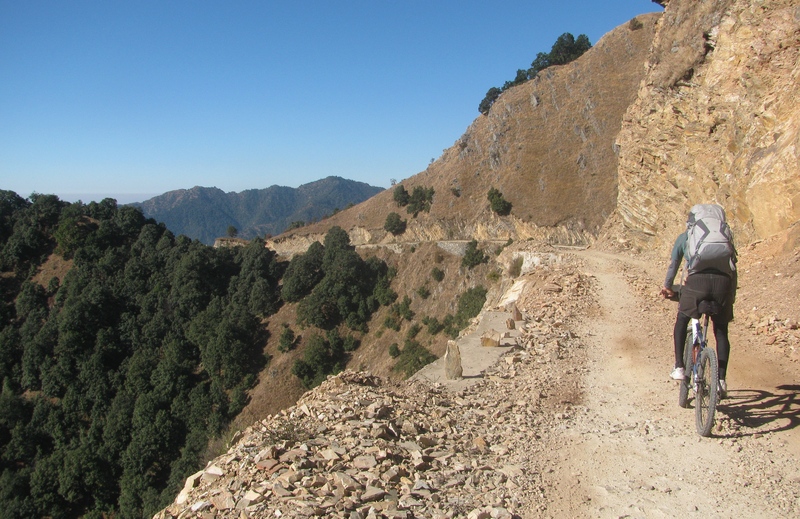 An interesting aspect for me was that the two major towns linked by our route were the homes of Uttarakhand’s army regiments – the Kumaon Regiment and the Garhwal Rifles. The former is headquartered in Ranikhet, the latter in Lansdowne. Our disappointments on the trip were probably just two. One fine day, Ravi decided that we would ask for a large citrus fruit called malta and get one free from somebody’s tree. It was to be the memorable postcard experience of tourism – you ask, a smiling face generously gives. We found two men seated near a cluster of malta trees. They pointed us to the owner, an old lady. Unfortunately she was in a grumpy mood. “ NO,’’ she said firmly. We dropped the malta plan. The other, was the curious case of some young men who looked at a pair of cyclists as a threat to their importance. While it was common to have youngsters quip that they had done similar trips or more, I was nearly unseated once when a youngster thrust his leg into my way as I cruised downhill. The people we could confidently engage with were retired military personnel. They had moved around the country on work and were at ease with strangers. I have always believed that the true gift of travel is how it takes you away from family and familiarity and makes you vulnerable. That state, bereft of ego, is when you know life. There was one memorably amusing episode from the trip. We were camped in a field just below a rough, unpaved road. There had been little traffic on the road the previous evening, when we arrived. So we had had dinner at a shop some distance off in town (a small junction to be precise) and cycled back to the relative isolation of the field. We put up our tent and fell asleep quickly; it had been a long tiring day. Late in the night, an individual or two, walking along the road had shined a torch in our direction. It is not always that you see a tent in the adjacent field. Early morning was tad different. We heard approaching conversation and then an abrupt cessation of talk as the passersby discovered the tent. Both Ravi and I, were feeling too lazy to stir out so early and engage the visitors. So we stayed put in our sleeping bags, hoping that they would go by as the others before did. But the sound of walking had stopped. The sound of soles on sand and gravel emanated as the visitors shuffled down the side of the road to the little clearing where the tent stood. There were mumbled comments and grunts, the usual accompaniment of checking things out. I was now wide awake, half wondering whether I should step out and say hello, which is the best way to avert too nosey an inspection. The worry in such situations isn’t the inspection per se. It is the potential damage to camping gear, not to mention – our cycles kept outside. If someone can guide the curiosity it helps. But I didn’t want to get out early on a winter morning. Besides it was that sweet spot when the cold of a night bidding goodbye met a hint of the sun. Both day and night were languorously mixed. I stayed put in the sleeping bag. We could sense people close by, our worlds separated by mere tent fabric. There was a round of laughter after it. The sound of shoes started moving away. It crunched sand and gravel climbing back up to the road. Then it slowly faded as rhythmic strides. Within the tent both of us had stifled our laughter at the comment till the visitors left. Now we got out of our sleeping bags and the tent laughing our heads off. Pronounced dead, I felt like a ghost, a happy ghost. Ravi got the stove going for the morning coffee. I took a photo of him at work; then stood there savouring the morning chill. That comment about me, hailing as I do from tropical Kerala (Mumbai where I live is also hot and humid), was my take away from this trip. It’s nice to be still alive. Once in a while I pinch myself to make sure I didn’t die in that tent. Or maybe – I am the ghost who writes? This entry was posted in Human Interest, Industry, Outdoors / Travel, People, Sports. Bookmark the permalink.